Leading global Money Transfer, foreign exchange and payment solutions brand, UAE Exchange announced its partnership with the payment gateway firm SADAD in the Kingdom of Bahrain. The tie-up will provide customers with 24/7 international and domestic money transfer service through self-service kiosks countrywide. The launch event was held at Downtown Rotana, Manama, in the presence of senior officials from SADAD and UAE Exchange, and other business partners, associates and customers of the UAE Exchange brand. 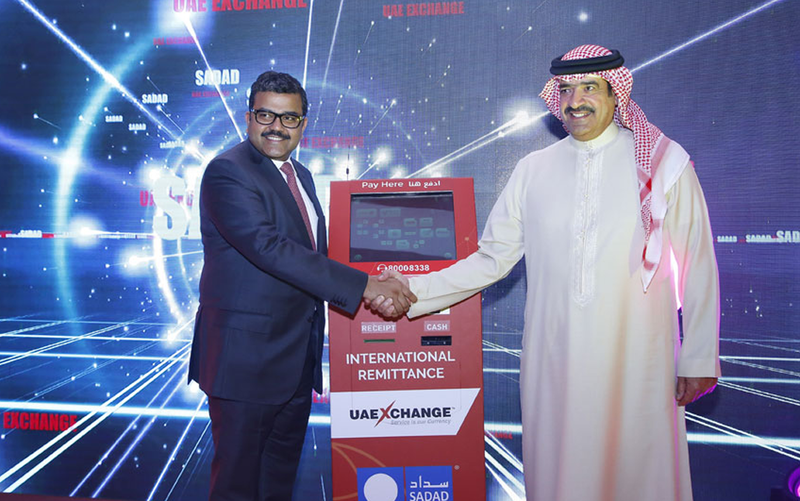 As a first-of-its-kind initiative by an exchange house in Bahrain, the self-service kiosks will facilitate round-the-clock money transfers and provide customers with a wide range of bill payment solutions for utility providers in Bahrain. "We are proud to take our partnership with SADAD to the next level. The self-service kiosks are not only an innovative, convenient and incredibly secure way for customers to transfer money home but also, add to the credentials of UAE Exchange brand as a fintech innovator. Bahrain, as a nation, has a progressive vision and quite an enriched business landscape for enterprises to innovate, providing huge opportunities to bring the best to customers. We are also extremely thankful to the Central Bank of Bahrain for their support and guidance right through our journey. This new innovation in remittances in the market reinforces our commitment to prioritise value and convenience for customers while collaborating with specialists. The additional touch-point further boosts our capabilities as an integrated financial service provider, offering unparalleled service excellence," said Promoth Manghat, Chief Executive Officer, UAE Exchange Group. Customers using the self-service kiosks for money transfer will be required to first register themselves and their beneficiaries with UAE Exchange as part of the brand’s Know Your Customer (KYC) policies. "SADAD is pleased to partner with UAE Exchange to explore new ways for customers to conveniently access financial transactions. The launch of the self-service kiosks further strengthens our partnership, as we seek to continuously deliver customer satisfaction. We look forward to the collaboration and enhance our customer service in the Kingdom of Bahrain," said Shaikh Ali Abdulla Hamad Isa Al Khalifa, Chairman, SADAD. "The self-service kiosks are strategically placed across the Kingdom of Bahrain in locations that enable accessibility and customer convenience. The kiosks are designed for ease of use coupled with maximum security, and allow pre-registered customers to send money any time, with just a few simple taps on the kiosks’ touch-screens. This initiative is yet another way that UAE Exchange is bringing value to its customers in the Kingdom," said Vineesh Kumar, Executive Director & General Manager, UAE Exchange in Bahrain. Earlier this year, UAE Exchange had launched a purpose-based payment service in collaboration with SADAD through which residents in the Kingdom of Bahrain can pay local service-provider bills at any of the 12 UAE Exchange branches. This includes payments for Viva Prepaid, Viva Postpaid, Zain Prepaid, Zain Postpaid, Batelco Prepaid, Batelco Postpaid, Electricity and Water Authority bills.